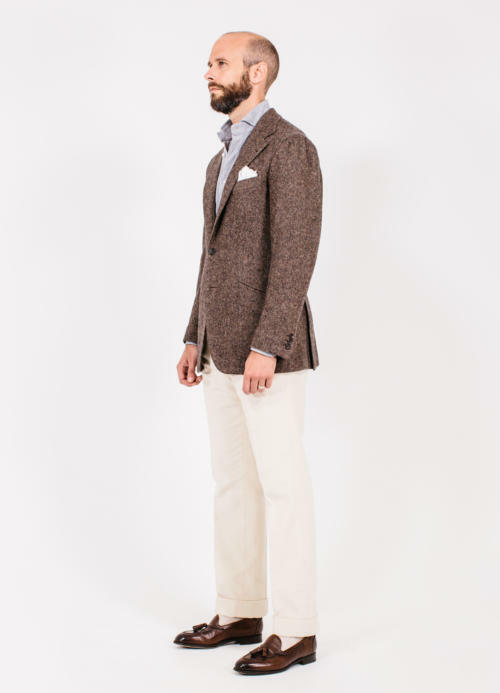 In previous installments in this series, we analysed what could be considered the modern Neapolitan style (a Solito jacket) and the traditional one (a Ciardi suit). Next, we look at how different elements of these can be combined in a Neapolitan suit – along with some idiosyncratic elements. It is a cashmere-donegal jacket from Rubinacci, and is something of an outlier among all the pieces I have had made bespoke in Naples. The jacket was made in 2011 – the first piece I ever had made by a non-English tailor. Rubinacci had recently established their shop on Mount Street, and were the only high-profile Neapolitan available for men in London. They caused something of a fuss, with writers like Nick Foulkes becoming a big client, and The Rake covering the visits of Luca or Mariano Rubinacci consistently. I was eager to try the Neapolitan style too, and commissioned a jacket in a vintage cashmere cloth that Mariano had in the shop. It is a lovely mid-brown, woven in a donegal flecked style. I was measured by Mariano but travelled to Naples for my second fitting, following the advice of another customer who had had a poor experience just being fitted in London. Fortunately, following this path my jacket turned out well, and it’s still something I wear regularly. However, as alluded to in the introduction, the style is not what you might expect. The most obvious point is the lapel. Every other Neapolitan tailor I have used has a straight lapel, actually looking a little concave as it bends into the waist button. But the Rubinacci lapel is curved outwards. It has what a tailor would call ‘belly’. This is a shape more normally seen on English suits (and, given how many suits are now made in an Italian style around the world, makes them look distinctive or antiquated, depending on your point of view). The Rubinacci lapel is actually more curved than the English, as they tend to be slightly rounded at the waist button, and then straighten as they approach the collar. Now, not every Rubinacci jacket has this style of lapel. Luca Rubinacci’s style exploits in particular mean his house varies more than most others. It’s also noticeable that Luca used to have this lapel on his jackets more in the past than today. But a customer should still be aware that this belly style might be the default – as it was for me – and that the variation means you have perhaps more choice than elsewhere. This Rubinacci jacket is abnormal in other areas too. It uses the English-standard three layers of structure in the chest, including one layer of horsehair, where other Neapolitans use fewer and lighter layers. Its shoulder padding is made up of three layers of wadding, which is not as much as the English, but still more than most Neapolitans. And most unusual of all, it adds a small piece of wadding right at the end of my shoulder, to lift it up slightly as it approaches the sleeve. Now as I have sloping shoulders, most tailors outside Naples will want to do something to compensate. The English often add more padding; the French emphasise the roped sleevehead; the Milanese tailors and 1960s-influenced tailors like Edward Sexton or Chittleborough & Morgan add padding at the end of the shoulder – like this Rubinacci. But my Rubinacci jacket is the only one to have a relatively lightly padded shoulder, and then add that kick at the end. The effect is subtle on this jacket, because once there’s been that kick, the shoulder runs into the top of the sleeve very naturally. A final point of difference is the fronts (the line of either side of the jacket below the waist button). These are quite closed relative to other Neapolitans, and again more similar to the English. Even the way they curve at the bottom is more anglicised. Elsewhere, the shoulders themselves are quite narrow (5⅞ inches) but don’t really appear so given those wide, curving lapels and kick to the shoulder padding. The sleeve is fairly generous for a Neapolitan tailor, although tapered towards the cuff. And the jacket is quite fitted through the lower back, running closer to the body than many. In fact that, the softness of the cloth, and being only half-lined are probably the biggest causes of the jacket looks a little short in the back, not fully covering the seat. Style-wise, the jacket also has a few idiosyncrasies. One of these is the curved hip pockets (shown above), which were something Mariano suggested to me at the time and I was happy to try. His version of an English hacking pocket, they are unusual (I’ve only had it elsewhere from Timothy Everest) but over time I found I disliked them – particularly as the curved flaps are a little deep (2½ inches, where most would be 2¼). As a result, I usually keep the flaps tucked in. A last point is the sleeves, which we kept unlined. This can be a nice thing on a summer jacket that you want as cool as possible, but only where the cloth is smooth and has less friction (eg cotton). It’s a bad idea on a wool or cashmere. It’s a pain getting your arms in and out, and there is little benefit in coolness. 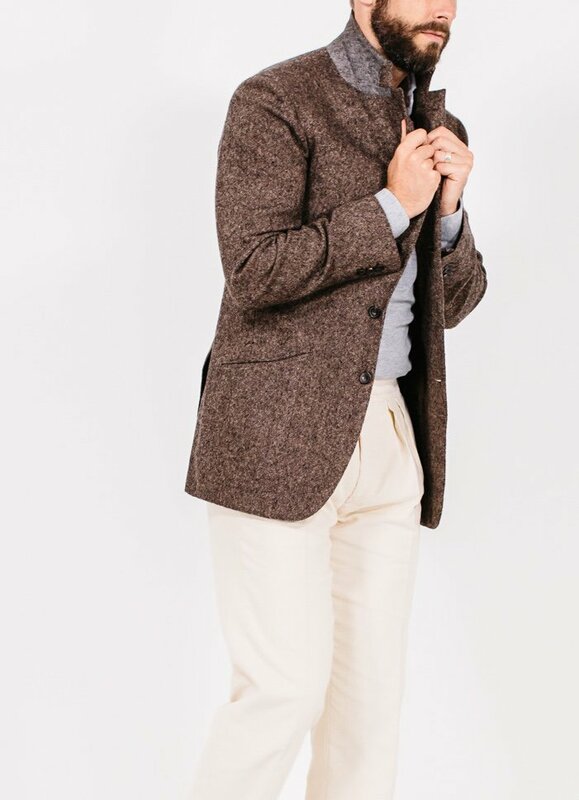 The other pieces I’m wearing with this jacket are: cream corduroy trousers from Pommella, a white linen handkerchief from Anderson & Sheppard, and my light-grey Friday Polo. Grey is the one colour of Friday Polo with decent stock at the moment – although even there we have no mediums left. The shoes are Belgravias from Edward Green – a loafer that fits me surprisingly well (the 184 last) given my narrow heels. You can follow the discussion on Rubinacci donegal jacket: Style breakdown by entering your email address in the box below. You will then receive an email every time a new comment is added. These will also contain a link to a page where you can stop the alerts, and remove all of your related data from the site. Nice jacket but very pricey. You mention that the sleeves are unlined. I’m commissioning a linen suit for a summer wedding in Portugal. The thought of having the trousers unlined and the jacket unlined quite appeals to me. What are your thoughts/experiences with no lining? Obviously , I’d hand to line the front of the jacket. No lining is worth doing on a summer piece like that. Small downsides that it might be more fragile, but that’s about it. I’d still probably line the sleeves though – you don’t lose much heat through there compared to the back for example. I would always go for a buggy lining on a linen coat. Happy to go with unlined trousers and I wouldn’t bother to line the sleeves. Thanks for the replies. Unlined trousers it is. Simon, would you bother to line the back of the linen jacket? Also, why would it be more fragile if I skip the lining? Also, any particular reason why you’d line the sleeves? The top of the back (so a buggy lining, or half lining) I would line, yes. Because it’s so much more comfortable to put on and wear. The jacket can be more fragile because it doesn’t have the support of the lining. I’d line the sleeves because again they can be a bugger to get on and off, and that’s not where the benefit of heat escaping is likely to be. Thank you very much for clarifying. Much appreciated. Trousers are fine unlined though? What’s with all that vanity? With the money you pay in UK you can easily go to Napoli spend a weekend and buy three jacket same quality,maybe the same one. There is no such a thing as the biggest brand or name in Napoli,there is just if you are in big ten and they are all as good as it can get. And there is next ten as good as the previous one. If I recall, in previous installments of this series you mentioned that you worked with a cutter to analyze all suits and jackets. Do you know what his impression of the finishing of this jacket was, or do you have any thoughts on the finishing of Rubinacci compared to other Neapolitans? Yes, we worked together on all of these pieces. are you sure the knee measure is 29.5″? Simon, would you please explain what finishing is exactly and its importance, or lack of, in the construction of the suit. Sure Scott. By finishing, people mean the sewing on the outside of the suit that you can see – rather than the construction inside, like the padding of the lapel, or the way panels are sewn together. That includes hand-sewn buttonholes on the outside of the jacket, and perhaps prick stitching along the edges, but also the way the lining is attached on the inside and the way to pockets are cut into the lining (or not). It’s mostly just aesthetic, rather than making a functional difference to the jacket. And the best is normally finer and more consistent – so more stitches to the inch, cleaner stitching – and details like a Milanese buttonhole or decorative stitching. Thank you! That’s what I thought, but this clarification is very helpful. So, in your opinion the English tailors do a better job of finishing, in general, then the Italians? On average yes, though the bigger difference is probably between southern Italy and northern. Caraceni is very good. But the French are the best. May I make an observation? I think you would benefit greatly from having your jackets increased in length by a good 1/2″, maybe a touch more. Having looked at many of your articles, it always seems they are too short for your body shape. For example, looking from the side, they emphasise your hollow back and protruding backside. Cut longer, the top of the vents would start that much lower (whilst remaining the same length overall) and give a smoother line running down to the hem. By the same token, the view from the back would drop a little and more effectively cover your bottom. From the front, they mostly seem to stop slightly above or in line with the bottom of your fly and again a tad longer would overcome this. It would have the advantage also of allowing the button stance to drop lower, elongating your torso, giving you a bit more swell in the chest and taking the eye away from your sloping shoulders. The only jacket l see on you which fairly reflects your shape and proportions in the Sexton DB which looks perfect. Of course David, a good observation and well received. I think there are two aspects to this – one technical and one stylistic. I agree that a longer jacket would cover my seat more, and across the series you can see that from several other makers, particularly the English ones. (Although I actually find a higher vent helps deal with the seat, rather than a lower one.) The issue with the lower back is easier to control – more or less suppression there deals with that I find. From the front, the angle of the opening probably makes a bigger difference than the length – a Neapolitan with a large, rounded cutaway will seem much more exposed. And on the button stance, one of the interesting things in comparing jackets in this series is that actually the waist button can vary considerably in height, whatever the length. So I think that could be raise or lowered without changing the length if I wanted. The other point is style. Longer jackets just look smarter and more formal. I have had softly made jackets that are longer, and they just look too smart, certainly for jeans or chinos. So if you want a jacket that works with a much more casual outfit, then you sometimes have to compromise on what would be a better technical length. Thanks again for the opportunity to talk about this. I am 5’11” and have my coats made at 31″ with the button at 19.5″. My chest is around 43″ and waist 35″. I have my vents cut at 10″. Same measures for formal. informal, heavy tweed or fresco. Just seems to work and makes life very easy indeed for my tailor (who has made a few suits for you). Hi Simon – with your measurement of the length of the jacket what point do you start from at the top? And might you be able to disclose how tall you are? Will you be doing an overview of your Vergallo pieces? It would be good to have a comparison of northern Italian vs southern Italian. As an idea, you’ve covered guides to tailoring styles, how about some of the more technical points? So , suit lining, turn-ups, buttons, pleats etc. You’ve covered these points before. However, a guide in the same vein as your fabric guides would be good. Thoughts? Yes, nice idea. So a series providing deeper information on each of those in turn? Yep. Exactly. I bet if you go through the comments, there will be a lot of questions covering these topics. Having a guide section would also allow readers to post and lookup in a single place. Given that you’re talking about a bespoke jacket, is it correct to say that the style is Luca Rubinacci’s? He is neither the cutter nor the tailor. Is there somewhere on the site you can point me that explains the difference between, full canvas, half canvas, floating canvas etc.? But basically, a jacket has a canvas to give it shape. It can run half way down the body or the full way. Most good suits run all the way; there’s a small argument you might want only halfway in a cheaper or lightweight jacket. And that canvas can be sewn to the outside or glued. Sewn means ‘floating’, glued is called ‘fused’. – Great post; so far Rubinacci essentially meant wide lapeled DB to me. Here it seems there is extensive British influence, both in the construction and the style. – Do you see a substantial difference of comfort with the traditional Neapolitan and English constructions, especially on the shoulder and breast. Is it similar to french or Roman jackets in that aspect? – wondering whether you spoted a tailor making English/french style casual jackets with a very soft (Neapolitan like) construction? – I also dislike hip pockets bent that way. I’m not sure what you mean exactly on your second question, but I certainly notice a comfort difference between Neapolitans and English – but not between Neapolitans and this Rubinacci. No, I haven’t seen a tailor make in that style. Among old bespoke tailors the make and style usually come as one. You see mixes more in new markets or tailors, eg in Japan. I like the way the colour of the socks continues the trouser line to the shoes. A very elegant look. I have always thought patterned or brightly coloured socks as jarring. Nice point. 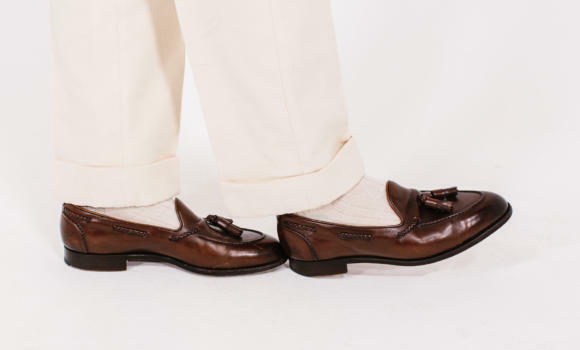 Generally in classic menswear the default is to match the socks to the trousers, the theory being that it lengthens the appearance of the leg. Coloured socks or even patterns can be nice too of course, but often sock manufacturers in particular go over the top. It’s not subtle and therefore often looks cheap. Brightly coloured socks are fine, but beware of the context. Not really law or finance, but in the right place a canary yellow sock with a navy flannel and snuff suede shoe can really sing. Cardinal red against charcoal equally so. If patterned, it has to be oh so subtle. The Simpsons were made for TV, not socks. Length aside, I like the silhouette of this jacket. The strong shoulders suit you well without being roped, a feature I generally dislike. My primary issue with the piece, though, is its connotative incongruity. 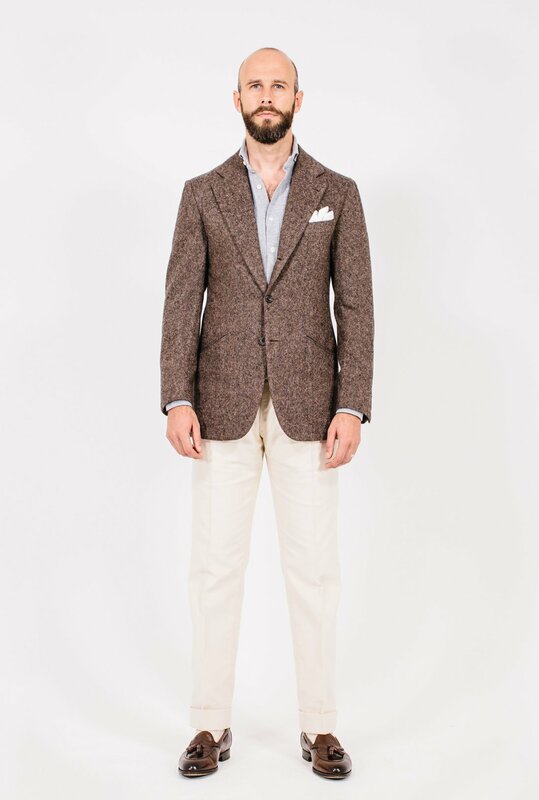 The texture of the fabric is rough and earthy, which seems to call for tweed rather than cashmere. 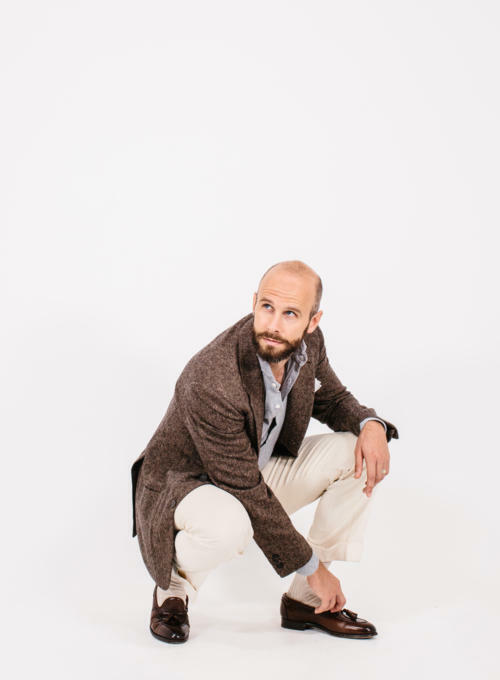 The length, hacking pockets and, again, texture of the fabric make the jacket decidedly low-key and casual, but the bold, sweeping lapels suggest drama. Given the heaviness and softness of the fabric, finally, the horsehair interlining seems unnecessary. All of this is made more vivid with a comparison to your Caliendo tweed, one of my favorite commissions of yours. Nice ensemble with a subtle colour palette. This could be worn in so many scenarios. The jacket is nicely balanced. Thanks for giving detail to the slight kick in the shoulders – it’s very subtle. Strangely, what I really like is the shoes! They make the outfit. Not sure if we have seen much of these before (EGs) has there been a piece on them? Has your preference concerning the trouser length changed over the years? I recently reread an older piece, where you advocated for a slight brake at the front, but it looks like you’ve moved to no break? 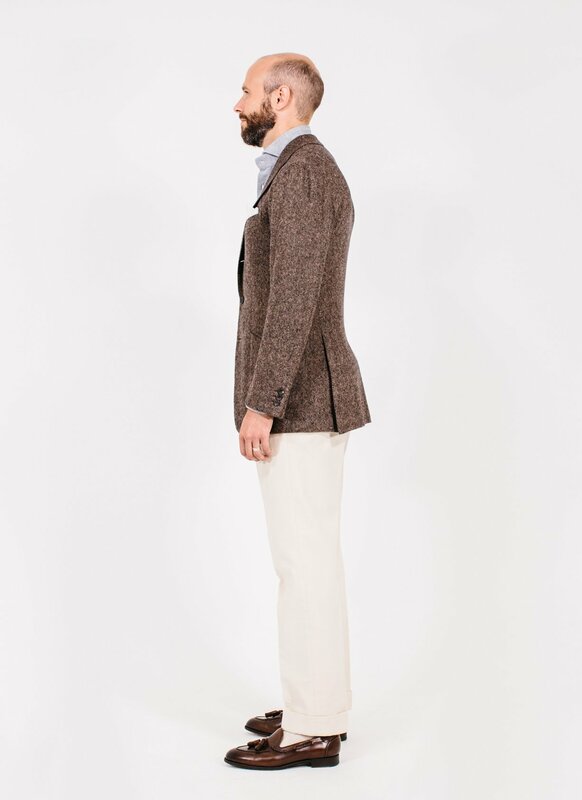 I’ve come round to preferring the no break length myself both for dress trousers and chinos as it gives a very clean silhouette and find that it is becoming more popular at the moment? I can add some perspective based on quite a few Rubinacci suits and sport coats I had made in around 2008-12, mostly in Naples with Mariano, a few initiated in Milan and New York with Luca. I’m still wearing every one of these — they endure; I’ve only had to re-line some of the coats. Stylistically, it’s not an accident that the firm is called London House. I’ve loved the Neapolitan approach, but restrained, of Rubinacci. None of my lapels is bellied, so I’m not sure why Simon’s experience was different – but perhaps, in true bespoke fashion, there was a good reason (to calm his tall narrowness?). Initially, I wanted spalla camicia shoulders, but was politely ignored because that was wrong for my physique, which I realize in retrospect. I have one coat with the curved side pockets, whose flaps I also keep inside, and I like them for variety. 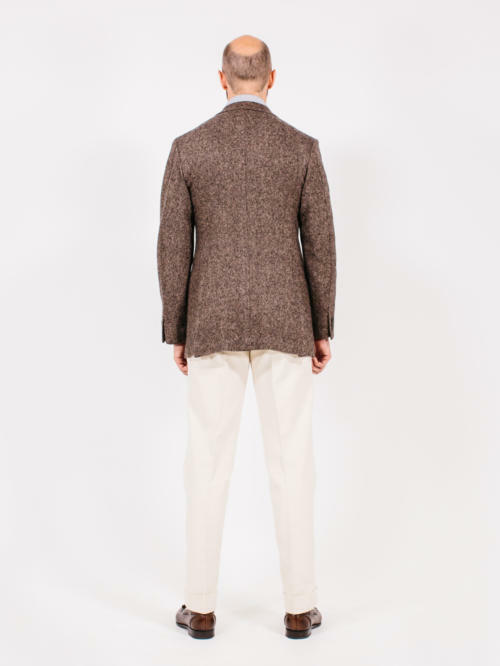 I can’t imagine why coats made from heavy cloth would be unlined in body or sleeves, but all my linen and linen-mix summer coats have minimal body lining and no sleeve lining – I think the latter is especially wonderful because, unlike a coat body, you can’t really open the sleeves for air circulation. A little more difficult to put on and take off, but that just reminds you that there’s a good reason for no sleeve lining. The only style issue I pushed (a bit) was getting the suit trouser widths a bit narrower down to the cuffs. If you like the general Neapolitan approach, I recommend trying to get to Naples, and then follow their advice. Interested in knowing what about your shoulders made a spalla Camicia inappropriate. Thank you. Like Simon, my shoulders slope down quite a bit, and my Rubinacci costs correct for this in what appears to be the same way. My impression – which may well be incorrect – is that a spalla camicia would be inconsistent with that approach, or perhaps impossible. Thank you. Maybe R wanted a strong rope to (visually) lift the shoulder at the end without adding padding to the shoulder. Assuming a spalla camicia is rarely associated with a rope. I once visited their Mount Street shop and was instantly put off by their appalling lack of service. They seem to think they are the curators of a shrine to Signore Rubinacci and that anybody who opens the door is an unwelcome interloper into their Italian parlour. Beyond that, the jacket looks OK apart from the patch pockets cut at a slant which makes the thing look like it’s trying too hard. Reading this review, I can’t quite decide if you’re happy with the jacket or not! For what it’s worth, I think it looks fantastic; the fabric is a great colour, and I rather like the effect of the closed quarters and the “bellied” lapels. I even quite like the slanted pockets, although I can see how they might be a bit too unusual on an everyday jacket. Is the price one of the reasons you haven’t commissioned anything else from them? Or is it more to do with style? 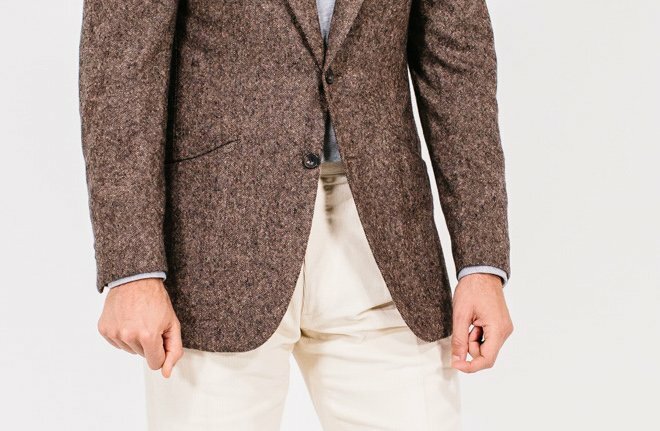 Also, with all those “English” style points, do you find this works as well with jeans/chinos as other Neapolitan jackets? I guess it’s not an overall review, just a detailed breakdown of the cut. Way too expensive for me but what a great jacket – that donegal is probably the best looking fabric for me. Can I ask why you decided to go for unlined sleeves at the time? The cashmere would be for the colder half of the year anyway? Touching on your decision to meet in Naples rather than London: do you agree that it is most ideal to be measured and fitted in the tailor’s city of origin for shoes and garments? If so, why? I assume if you had the follow up in London and you weren’t happy you would get them to send back to the work shop until you were happy? Very nice looking jacket Simon. I think this is third post on a differences amongst Neopolitan jackets. I’m curious which of the three you prefer at this point in your life…and why? 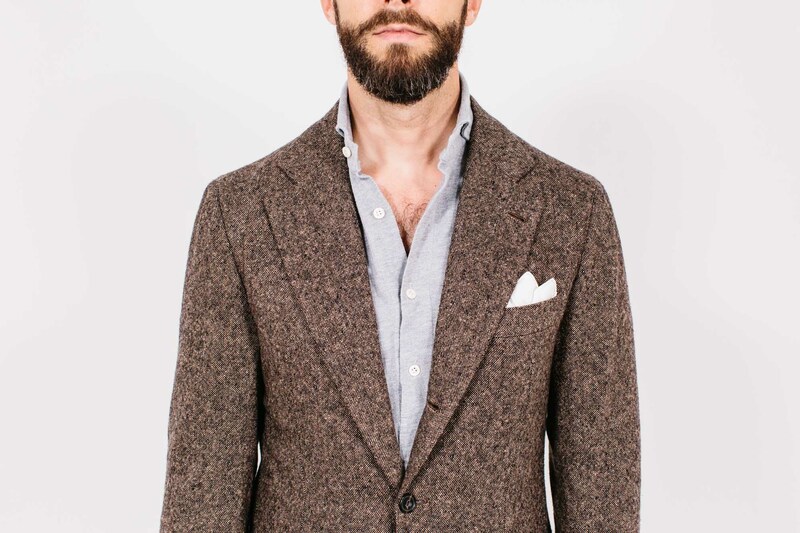 Have you ever considered purchasing/commisioning a soft wool or cashmere shirt jacket? I absolutely enjoy your posts and the inspiring pictures. The style breakdown specifically is an awesome read. I have two, rather general questions. First off, is there any personal rule you follow to pick a pair of brown shoes to pair it with a brown sports coat? I always struggle combining these and end up wearing super dark olive suedes. But your outfits always appear so fitting. By the way, I like this Rubinacci jacket. Looks very nice! Appreciate your answer! Keep up your great work! I try to keep a little contrast between the browns of a jacket and shoe, having one a little darker than the other. But I wouldn’t worry about it too much – trousers and shoes is a much harder one. Also, it can help if the shoe has some variation in colour, eg with an ‘antiqued’ or polished toe that is darker than the rest, as here. It means that some of the shoe will definitely be different to the jacket. Actually I think the style suits you very well. 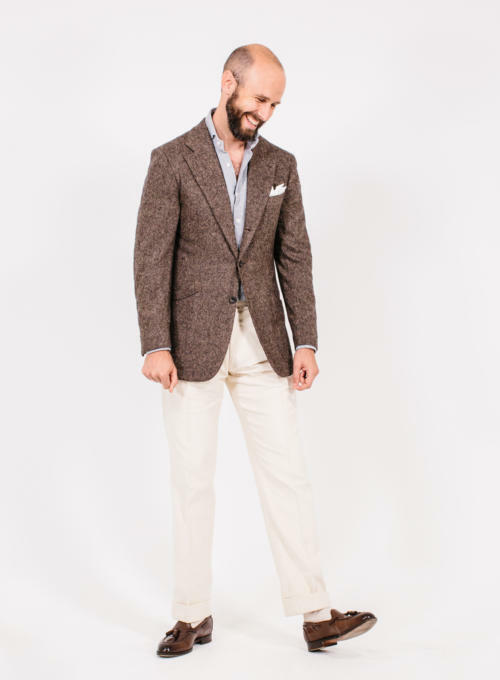 Jackets from other Neapolitan tailors can sometimes look slightly childish while this jacket with the style and the belly suit you very well. may i respectfully ask, how much are you tall mr. Crompton? Just a technical note… It appears the Ciardi style breakdown is not linked in The Guide to Tailors’ Styles. It goes from #10 Solito to #11 Rubinacci. This Rubinacci post references the Ciardi post as being an earlier entry in this series. Just wanted to let you know, so if it was intended to be in the Tailors’ Styles series, you could add it. Thanks a lot Ben, really helpful. I’ll fix that now.